Hello friends. Welcome back to the show. 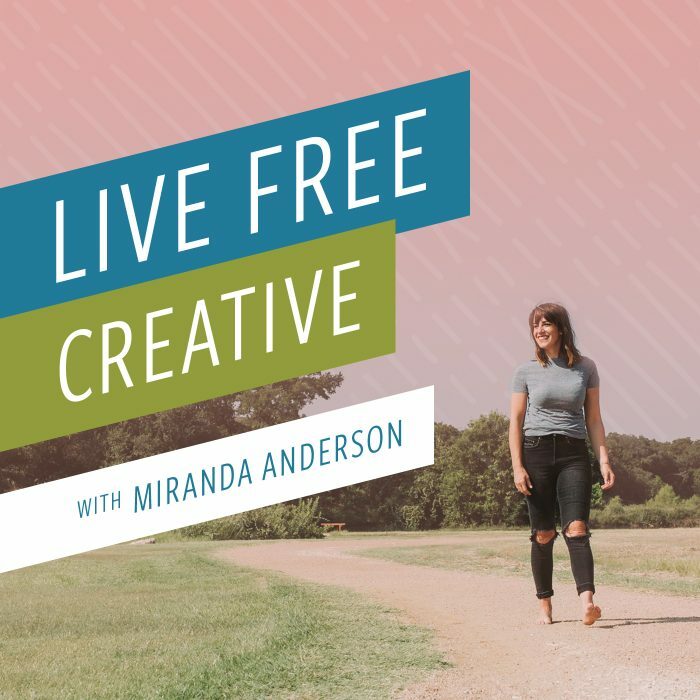 This is Live Free Creative Episode 33: Time And Seasons. Today I am recording in my closet of the rental house. It’s spring break and I have all three kids downstairs, hopefully quietly watching a couple episodes of Netflix. While I get this thing done. It’s that week, friends, just sometimes you gotta just figure it out, make it work. I said, I just need one hour. I’m going to take one hour, I’m going to get this out, and then we’re going to pack it up. It’s a beautiful day outside. We’re going to pack it all up, pack a picnic, take the dog down to the river, go on a hike. I told the kids we might go get some roller skates. They’re all really into the idea of rollerskating right now. And I’m like, yeah, let’s rollerskate! So maybe we’ll go rent some roller skates and try that out. It just feels like a really, really fun week. Good weather, good time. I’d been traveling a lot, so I’m really excited to just spend some time home with the kids and I’m excited to spend this one hour with you. It’s going to be less than an hour by the time I’m all done editing, sharing episode 33 time and seasons. You know how I’d like to start my episodes with a segment. So I’m going to jump in to a really funny segment. This week’s odd job. I remembered this job kind of out of the blue last week when I was at Alt Summit in Palm Springs. I was talking to someone about the podcast. She was mentioning that she’s really enjoyed the segments and it’s been really fun to learn all of this kind of random, that story when I share a magical adventure moments and when I share these odd jobs segments, and she said, how many more jobs can you have? You’ve done a bunch and I was like, Girl, you have no idea. I keep remembering them! I have a list that I made of all the jobs that I thought that I had and then every once in a while one will pop into my head and I’ll remember, oh my goodness, I did that too. So this is one of those ones that I hadn’t written down on my original list of jobs that I remembered because it was kind of random. It was a very short term and it was so out there. It almost feels like a dream now. For a while I was a Spanish translator for the Park City Police Department. Yes. You heard that right friends, this kind of tail winded dovetailed I guess with the job that I had that I haven’t shared yet about being a Spanish medical translator and I’ll share more about that in a future odd jobs segment. But this one was so interesting because I was picked up by the same agency for the, the job they needed done of transcribing some old Spanish interviews of a police case that had been done in park city years ago in the 80s. And they had been recorded but never transcribed. I don’t know a lot about how law enforcement works, but somehow this trial was coming up. So someone had preliminary lead, been put in jail, maybe there was an appeal, something, but this was a murder trial, a murder case that involved a Spanish speaking person. And they had done interviews and they had all been recorded in Spanish with a translator on hand. So there was an English officer, a Spanish and English translator, and then a Spanish speaking. There were a couple of different individuals that were interviewed that were Spanish speaking. None of them were the suspect, just for clarity sake, that I remember at least I don’t remember a whole lot about it. And of course I, even if I did, I couldn’t disclose it because it was all private. But I, my job was to listen to these old audio recordings and transcribe them. So I was listening and typing. The English officer would ask a question, I would type that out in English, I’d pause it so I could, you know, type it out. And then I would listen to the answer the response in Spanish and I would listen and type the response in Spanish and then type the translation in English so that anyone Spanish or English speaking could read through the transcript of this file and be able to understand what happened in the whole case. And they were going to somehow use this information in an upcoming followup of whatever had happened. So I remember Dave and I were in our very first tiny little basement apartment near the university. I was in nursing school. I spoke Spanish fluently. At that point I had learned Spanish as a teenager. I spoke and understood it fluidly and it was really a fun job. And this piece was so interesting because it wasn’t live translation like I had done when I was interpreting in the hospital. This was transcription. And so I had a little bit more time to kind of process through things, but I also was listening to the case as it unfolded. I didn’t know what happened and I think the reason this came up last week was because we were talking about podcasts and how you know, this is a self development show primarily where you know, people come away, hopefully feeling inspired and uplifted and maybe with a few things that they want to work on or change in their lives and it’s not a entertainment show where you’re left hanging at the end of each episode and you can’t wait to listen to the next episode to find out like what comes next in the story. This simply isn’t that format. And there’s a lot of podcasts out there that are wildly popular that leave these cliffhangers because it’s all like a murder trial for example. And I said, you know, I lived that, like I listened to the real life murder trial and was involved in transcribing an, it was a really bizarre, really interesting job. Right? Have you ever heard of that? Did you even know that people could do that? I didn’t know until I was hired to participate in that job and I was paid by the hour and at the end of the whole case, just so you know, tied it up in a, in a bowl, put it in the mail and shipped it off to the park city police department for them to have their full Spanish English transcription of the, you know, couple interviews that had been done years and years ago. And I thought, Huh, that was an interesting role to play in this, in this whole situation. You guys, if that’s not an odd job, I don’t know what is, it has nothing to do with what we’re talking about today. But it was just kind of a fun memory and uh, now you know, something new about me. Okay. I’m so excited to jump into the topic of today’s episode. This is a topic that hit me like a ton of bricks a few weeks ago when I was in Munich, Germany with Dave. He was there for work and I was there to tag along. It was my birthday weekend, so I spent some of the days alone wandering through the city. I went to some parks, I went, you know, window shopped and some cute boutiques. And one day I spent most of the day at the Science Museum in Munich. This is a huge, beautiful museum. It reminded me of kind of a mash up of some Smithsonian museums in the states. There were different wings that had different types of topics and focuses and cool exhibits. In one of the areas I walked into a room that was a clock room. Now if you think of Germany, you probably think of clocks, those really beautiful wooden cuckoo clocks and the interesting clock towers where you know, little people will come out and do a dance and it’s all part of the Bavarian culture. These really intricately carved beautiful clocks. So I was interested to see what kind of things I could learn about the clock making and the history in this German museum. So I went in and I started reading. I am like a sign reader in a museum. I love to pause and to read the whole backstory. And to kind of examine the the piece or the display I want to learn when I’m in a museum. So it makes it really nice to go to a museum by myself because when I’m with my kids or even sometimes with Dave, if we have different ideas about the speed or the things we’re interested in, you know, it’s not quite as slow and methodical. So I really read every single sign in this entire room and I came to one that made me stop and think this was one of the oldest clocks in the room and the sign next to it talked about how this one needed to be recalibrated each season because at the time that it was made, the clocks hours depended on the season, on the sunlight. So then from rise to sunset would be divided into twelve equal parts. And those were the twelve hours of the day. And then from sunset to sunrise was divided into twelve equal parts, which would be the hours of the night. This meant, now stick with me here because this is the piece I thought was so interesting that has caused me so much reflection over the last month. This meant that the actual amount of time in each hour changed depending on the season. So for example, in the summer, the sunrise to sunset was longer. We know that right, that the days are longer in the summer we say that, but in modern timekeeping, when we say longer, we actually just need, the sun is out for more hours, but the hours don’t change. The hours are still sixty seconds in a minute, sixty minutes in an hour, twelve hours, you know, technically of the of the day. Did you know it doesn’t matter what the actual sunlight hours are? That was a thing before universal timekeeping was a thing. The actual time change depending on the season. So in the summer between sunrise and sunset, you got twelve even lead divided hours. That means that in the summer, the actual hours were longer, the amount of minutes in each of the hours of the day was longer because of the season. Likewise in the winter, the hours between sunrise and sunset were shorter. They were actually shorter hours. If you were to measure them by universal time standards now they would be short hours. They would not be sixty minutes, they might be forty minutes because sunrise to sunset was a shorter amount of time in the winter. I don’t know if this is something that people learn and I just like it’s skipped over me or something in high school or junior high or whenever. This idea of time being flexible depending on the season. 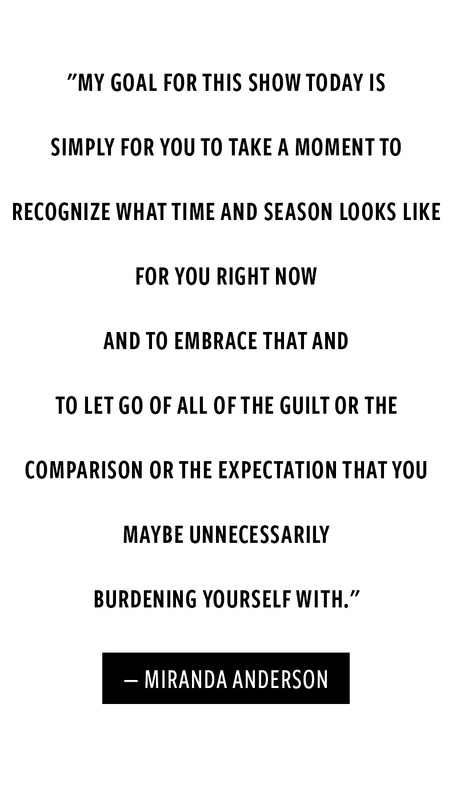 I had never thought of that before and it hit me so hard that this was such a more robust and really dynamic way to think about time and also to appreciate the seasons. As I was reading this and reflecting on it, it occurred to me how much stress and anxiety and apprehension and overwhelmed. We often create surrounding time. This idea of universal time and getting somewhere on time or how long something takes us or feeling like we behind all of the things in my life, all of the biggest things that caused me, you know, some overwhelmed, negative emotions have to do with time. And this sign was telling me that time itself is a construct that was created in modern ages with time is something that we’ve decided to agree upon but that it’s not real. And you know, I hope I don’t totally lose you because I think that this idea is so interesting and should be explored, especially if in its exploration we find some peace or some comfort knowing that it isn’t all the same for everyone all the time. 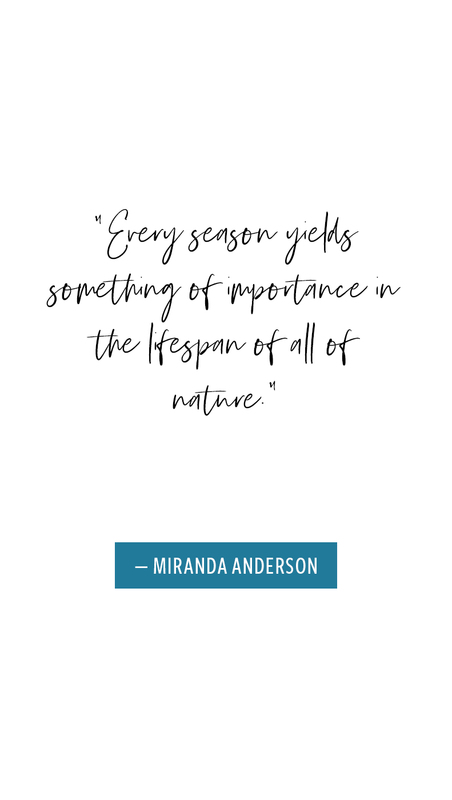 Understanding that the seasons determine so much about what should and can be expected from nature and also from ourselves. This simple act of reading the sign and seeing this old clock and thinking about, you know, the person that would rise up at sun rise in the spring and turn it and then you know, take a day to kind of figure out what the capsular calibration might be for the season or at least for the beginning of that season and that the timing would change as the season changed. That felt so wise to me. The idea of not expecting the things that are accomplished in the daytime in the summer to be the same as the things that might be accomplished during the daytime and the winter. Now this is all we’re talking like thirteenth century. This is before electricity. This is before you could just, you know, flip on a few extra nightlights and pretend like it’s daytime and get as much work done after bedtime as you do in the middle of the day. Which by the way, I have done for a lot of years. I spent lots of years working equally, you know, equal amounts of hours after my kids were in bed as during nap time and I wasn’t as efficient. It wasn’t very effective but it was kind of where I felt like I could get it in because I was trying to keep up with some undefined idea about what efficiency looked like. I was trying to keep up with what I thought I should be able to accomplish, what people who were around me in different seasons of life we’re accomplishing. This is what really I want to just explore for a few minutes and hopefully this will be helpful. As you consider your season right now and how your season right now is going to be different than anyone else’s and maybe by opening your mind and allowing yourself to consider time and seasons a little bit differently, you will find some peace in the present and you will find some acceptance in where you happen to be in your life today. Let’s back off of time itself for a few minutes and focus on seasons. Right now we’re in the beginning of spring where I live and it feels like this buzzing wonderful blossoming energy. There are little buds on all of the trees. Some are bursting into bloom. Last week in Palm Springs, the entire desert smelled like citrus because there’s a super bloom. There was enough rain and enough sun and enough heat for everything to bloom at once. So the entire desert is just on fire with poppies and with these beautiful yellow brushy flowers and then all the the grapefruit trees and the orange trees and lemon trees were all blossoming at once and it was just magnificent. What an incredible time this spring where everything seems to be blooming. You know those same trees that we admire so much in the springtime for their blossoms are what provide us sturdy and solid shade during the summer, they don’t stay blossomed all year round. Those blossoms burst and then they fall off and make way for leaves and those leaves stretch out and they provide us shade and some of those blossoms turn into fruit and it grows and we’re able to enjoy that for the summertime. We find ourselves in the shade. We enjoy that citrus and then what happens in the fall? All the leaves start to shrivel up. Some of them turned brilliant colors. Some just fall off. 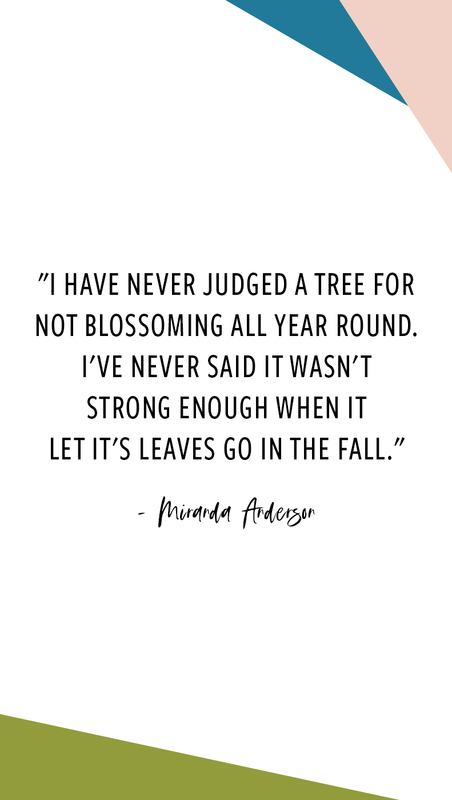 They let go, and I don’t know that I’ve ever looked at a tree and thought, gosh dang you for not being strong enough to hold onto your blossoms year round. Or that’s not a very strong tree, is it? Because she doesn’t seem to be able to maintain those leaves. We expect that these trees and the flowers and that the the flora and the fauna, we’ll all go through the seasons and we know what’s coming. We expect the trees to lose their leaves in the fall. We expect them to go into hibernation for the winter to be bare branched, and that doesn’t mean they’ve all died and they’re all useless. That means that they’re taking the time that they need to dig their roots down deeper to find nourishment within the soil instead of through the sun and the air. That means that they’re protecting themselves from oncoming weather and storms. What would happen if a tree kept all of its blossoms all the way until the middle of winter and then it was pounded by snow and by sleet and by rain and by ice. That tree would be so much more at risk because of all of that gentle foliage that it maintained. It would all be wiped out in a second, but also it would be ladened down. There will be so much more space for the snow to catch hold and those branches might start to break off rather than being able to shed the leaves and blossoms for the winter and hold themselves bare as can be to make it through until the spring comes again. I think there are so many parallels between the natural world and our humanity as I’m talking through the life cycle or the seasonal cycle of a tree. Can you imagine yourself in its place, you, you might not blossom in the spring and hibernate in the winter, but can you look back over your life and imagine how you have gone through different seasons? Some seasons for me blossoming. I mean, I’d say like my junior, senior year of high school, we’re big time springtime. I was involved in everything. I was on stages. I was on tennis courts, I was leading expeditions. I was, you know, doing all of the things involved with all of the friends I was. I had all my pedals out and I loved it and it didn’t last forever. There was a time that I needed to then shed some leaves, grow out of a few things that I had been doing, pair back a little bit, decide what was really important and I definitely spent some years, I’m going to say my early motherhood, there was a lot of hibernation. There was a lot of digging deep and sinking my roots down where there weren’t a lot of pedals and leaves to show for my day in and day out labors, but that doesn’t mean that there wasn’t growth and there wasn’t progress because the tree’s progress all through the winter. Some plants depend on the hardiness and the the strength of winter to enable them to then have the nourishment that they need for the spring and the summer months, and I fear that although that is the case for us, that we depend on those days and weeks and months and sometimes years of hibernation and of digging deep and of bringing it all in a little bit. We depend on that time for strength and for sanity and for peace and for clarity to allow us to then move forward into the next step where we start to shoot those little buds out again and where we once again start to bloom outwardly in a way that that, that everyone sees. One thing that I’ve noticed among my friends and even myself is that as I’ve gone through different seasons, sometimes I have acknowledged them without accepting them and fully embracing them. I remember when I had little babies saying, gosh, I’m just in this stage. I’m in this stage of diapers and being up several, several times a night. I’m in the stage of nursing. I’m in this season where I really don’t have the energy to do the things that I want to do, but I set that a little bit reluctantly and I set it with a little bit of guilt and maybe a little bit of comparison. The reason this is my excuse for not blooming like all of my other friends at this time, because I have this and this and this reason. Instead of embracing and enjoying and really nestling into that season thinking this is what I get to do right now. I am raising these little young babies. I am, you know, dedicating my days and my nights to care and nurture that these children cannot do on their own and forget about anything else. Forget about trying to blossom right now. That is not even part of the plan. It would be silly for me to even think about taking on more than what this stage requires of me because I need that extra energy so that when I get through this season with joy and with patience and with gratitude, I’m fully able to embrace the next as well. How often do we do that? I’m afraid. I don’t believe that it’s as often as we should, as we can, as we really ought to because this is how we are made. We are seasonal creatures just as the trees and the flowers are. I want to give an example of right now, not my personal self, but in my business. This year has been an interesting year so far because at the end of last year I decided I was going to cut off some branches for a while. The main focus of my blog for the last several years has been procuring sponsored blog posts. That enabled me to have a revenue stream so that I can provide lots of free content for my readers. I’ve been blogging for a really long time and the last four or five years of blogging have also produced an income. I knew going into this year that the number one thing that I wanted to accomplish was to finish writing, editing, revising, and publishing my book. And so I told Dave, as we approached the new year, I’m going to turn down ninety five percent of the sponsored blog content that comes my way. I’m not going to seek out new posts. And the only ones that I’m going to accomplish are ones that I either already have in the works because I had some already planned or that are with, that I know are really wonderful to work with that I’ve already worked with before. So normally where this first quarter of the year, I would have already made a quarters worth of my annual revenue. I have made very little money because I’ve said no to all of the opportunities that would provide a revenue stream simply because by choice that time that would be required to complete that work was the same time that I had in my life available to complete the book. And right now, one matters more than the other. So rather than looking around and seeing all of my friends who are bloggers, who are my coworkers, who I am in mastermind groups with and who I’m so proud of when they get these amazing sponsored posts and sponsored contracts, rather than feeling like, oh no, I’m behind, I’m not doing it. I, you know what a terrible decision. I have been reminding myself over and over again of the consciousness of my decision that this year is one not for lots of little buds and for lots of little leaves and lots of initial quick revenue. But this is a year of sowing for me. This is a year of planting the seeds of the book and in June it’s gonna, you know, we’re going to harvest it out and it will hopefully then provide opportunities to continue making money throughout the end of the year and into the future. And even if it doesn’t, it will be the tangible value that I add into the world this year. But can you see how I could easily be caught up even having made this decision consciously, I can easily be caught up into feeling like I’m behind because my season of work right now looks different than the people who I normally feel in companionship with in the things that I’m working on. Allowing myself this season to not be one of continuous output on sponsored revenue but of continuous input onto this book and the launch of it has enabled me to feel peace and clarity and really a sense of wonder and a sense of accomplishment because I am aligning my choices with my season and the season that I chose. I hope that makes sense. I hope that that example is helpful. As you think about the season of life that you’re in, whether it’s by choice, something that you’ve chosen that you want to step away from or step into and all of the things that that brings with it that are sometimes tricky and different than you may have expected or whether you find yourself some self in a circumstance that you didn’t know was coming a season where you’re ill or someone near you is ill. A seasoned where you’re having put a lot of extra energy and input inside instead of outside. Or the opposite, maybe a season where you’re finding lots and lots and lots of opportunities to blossom and to shoot out leaves and realize that maybe you’re going to pursue that for a while and that there will be time for rest. I want to jump back into talking about time for just a couple more minutes because I think that this idea is really powerful and really useful and applicable. What If Time Is Flexible? Imagine if time was still so flexible that the hours, the length of the hours changed depending on the season. What would that look like in your life? If you gave yourself more time for more and different things during certain seasons and you allowed yourself less time for certain things during other seasons? I think this is all so personal, but what it does with some self reflection as we recognize what season we might may find ourselves in, what that looks like, what the requirements are, and then be really, really accepting of the way that that reflects back to us what we may want to choose and what we may want to allow and how we’re probably being harder on ourselves than we need to be because that tends to be the way that we are. We tend to expect a lot from ourselves a lot of the time and maybe it’s okay to not run as fast as everyone else because maybe in the season you’re in you get longer hours and so the pace you’re going is just right because you’re going to get to the end when you need to. What if you had a new baby or a new job or a new diagnosis, you didn’t feel like you had to make an excuse to everyone about why you weren’t doing all the other things that you normally do? What if you didn’t feel like you had to say, Gosh, I’m sorry I didn’t get ready again. I don’t usually look like this, or man, you came over at the wrong time. My house is just a disaster area right now. We, you know, we’ve got a lot going on with soccer practice and with the play and all the things the kids are doing. What if it just was the way that it was and we recognize that it was all a reflection of the season that we’re in and that’s okay. What if in taking a look at the time and the season of her life right now, knowing that that can all be flexible and changeable and it’s really so personal. What if we could realize that, gosh, I really do have a little bit more energy right now that I’m spending, and so instead of just going along with all the things that I normally do, I have a little bit more to give. I’m going to take on something new. I’m excited about that. I think my days are feeling a little bit longer right now. What if we just got to determine that for ourselves? Allow yourself to feel the beauty of the spring, if that’s the season that you’re feeling, or to enjoy the hibernation and coziness of the winter, if that’s what’s required of you right now. Recognize that your energy bends and changes and is flexible depending on your life circumstance and also just the regular cycles and patterns of life. Allow time to also be this incredible flexible, dynamic thing that it is. Maybe try to back off of expecting things in their minutes or their hours, but instead allowing time to flow from one day into the next and the things that are left behind in one day can be picked right up again. What Season Are Others In? It’s also nice to use this new idea of time and seasons as it applies to our lives to help us find some charity and love and generosity towards the people in our lives who seasons right now look a little different than ours or even that look a little different than we might hope or might expect. Everyone is walking their own path. Everyone’s life and time and seasons are shifting and changing and we’re all trying to adapt and we’re all doing our best. I really do believe that we are all doing our best with what we have right now. I hope that as you listened to this show that some new idea has sparked in your mind that allows you to have a little more grace with yourself and with others. I know that the idea of flexibility and change within time and seasons of my own life has been really powerful for me over the last month as I’ve explored this idea and thought about it and how it relates to me and those around me. As the days go by, I hope that it’s powerful for you too. That’s it for today guys. I’m going to go relieve the kids from Netflix and we’re going to go find some roller skates and we’re going to pack a picnic and go out, hang out outside. I am feeling really good about the actual natural season that’s happening right now. That sunshine makes me feel like 1 million bucks and I’m so excited to go spend some time outside of my kids. I want to thank you for giving me your attention today. I don’t take that lightly, that you turn on the show, that you listened to it and that you absorb it and hopefully that you’re able to use pieces of it to better your life, to feel like you’re able to be free to live a little bit more fully the light that you want to live. As I do every week, I want to invite you to share this episode or another fee for episode with a friend. Take some time if you haven’t yet and go leave a quick review on iTunes. It takes two minutes. You will feel so good. It doesn’t have to be long. It can just be a sentence or two. Why didn’t you just go right? Why you turn the show on every week, what it does for you and how you might recommend it to someone else. You are also wonderful. I hope you know that and can feel that. Thank you for being here. I hope you have a wonderful week. I will talk to you next time.